At the Interfaith Center at Stony Brook University, Mrs. Sanaa Nadim, Chaplain of the Islamic Society of the Interfaith Center at Stony Brook University, invited Dr. Aly El-Samman, President of the International Union for Intercultural and Interfaith Dialogue and Education of Peace (ADIC) to present his book, Three Windows on Heaven - Acceptance of Others, Dialogue and Peace in the Sacred Texts of the Three Abrahamic Religions, a book he edited with prominent international Jewish, Christian and Muslim specialists. The event also featured other speakers, in particular Rabbi Joseph Topek, chairman of the Interfaith Center of Hillel for Jewish Campus Life; Joanne Buonocore, Catholic Campus Ministry; and Helen Chueng, Asian Christian Campus Ministry. Speaking to an audience of distinguished guests and students from the Interfaith Center, Chaplin Sanaa Nadim introduced Dr Aly El-Samman as one of the most famous activists in the field of intercultural and interfaith dialogue, emphasizing the part he played in promoting dialogue, not only among the monotheist religions but also all religions, at the international level. 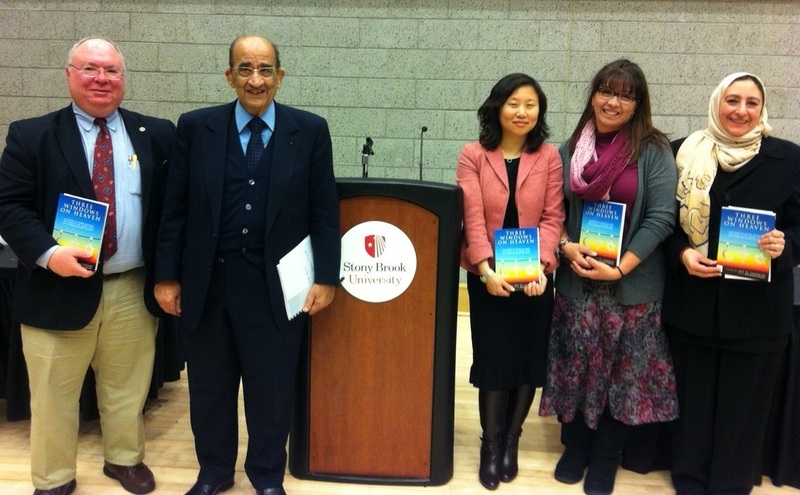 Dr. Aly El-Samman acknowledged Stony Brook University Interfaith Center, their representatives and the role played by Chaplin Sanaa Nadim, the leading force behind the organization of the event, citing her modesty, dedication and love of others. He spoke about promoting the humanity of dialogue stressing “I believe that by recognizing the humanity in others we become fully human ourselves. Dialogue is not only necessary for avoiding clashes and conflict, it is also useful for exploring the meaning of life, appreciating cultural differences and finding the common threads that bind us all together”. Rabbi Joseph Topeck related his work in the Jewish community for 35 years, his relationship with other minorities mostly African American and Muslim as well as his experience at Stony Brook University, which led him to an understanding of the importance of dialogue and serving others. Joanne Buonocore elaborated the importance of becoming more human, trying to be happy in life, to know each other, joining in faith and finding happiness in God. Action is part of faith regardless of what faith it is. Helen Cheung, referred to Mother Teresa as a great source of inspiration to her. By helping her open her mind about her faith, she came to understand her faith through the journey of others, that God is love and that a smile is the beginning of love.